The movement of water molecules through a semi permeable membrane from the region of higher water concentration to the region of lesser water concentration is called osmosis. 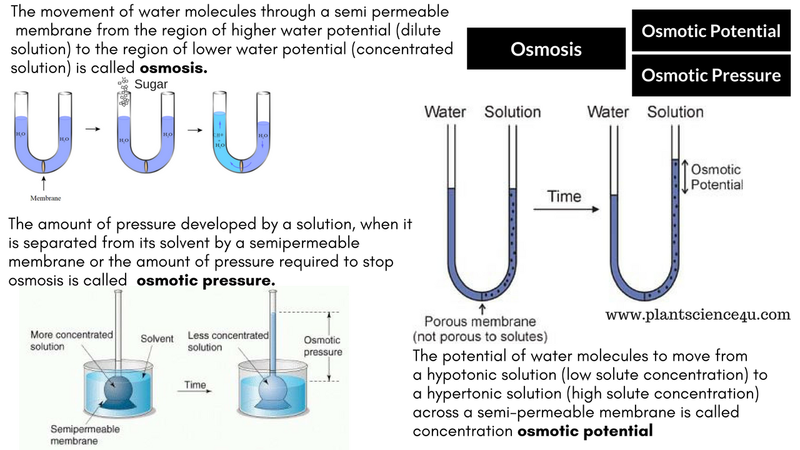 Osmotic Pressure (OP): The actual pressure, that develops in a solution, when it is separated from pure water by means of semipermeable membrane. It depends upon concentration, ionization, hydration and temperature. It is measured in terms of atmosphere (atm). R= Gas constant and T= temperature. Osmotic potential: It is the decrease in chemical potential of pure water due to the presence of solute particle in it. Where C = concentration of solute particle, R = gas constant and T= temperature. 1. It is the pressure which develops in an osmotic system due to entry of water into it. 2. It develops only in a confirmed system. 3. The value is positive through numerically eual to osmotic potential. 1. It is lowering of free energy of water in a system duet o the presence of solute particles. 2. Osmotic potential is present whether the solution occurs in a confined system or an open system. 3.The value is negative through it is numerically equal to osmotic pressure.